Taichung Park (台中公園) is a 10 acre park situated within the downtown core of Taiwan's central Taichung city. The park is the oldest in the city with a century-old history dating back to the Japanese Colonial Era. The massive park is an important recreational area for the people of Taichung with all of the typical sporting amenities you'd find in any other park in Taiwan but also features several important pieces of Taichung's history mixed in with jungle gyms, basketball courts and a massive lake for kayaking and canoeing. Original known as Nakanoshima kōen (中之島公園) the park was constructed in 1908 and has been listed by the Taichung City Government as historical site thanks to some of the historical monuments found within that date back as far as the Qing Dynasty. I'm not going to focus on each of the historical monuments found within the park but I'm going to make more than one post to explain in greater detail what I perceive as both the good and the bad aspects of the park. 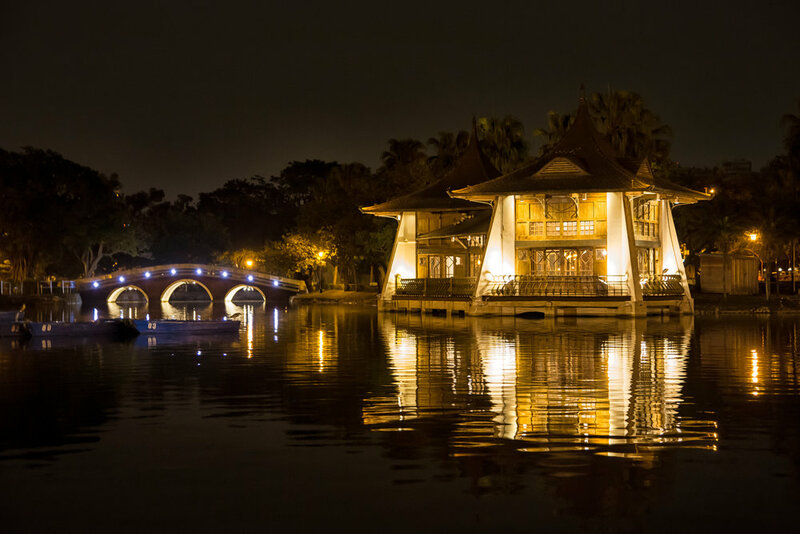 My first post is going to focus on the positive with the beautiful Mid-Lake Pavilion while the second post will be a bit of a rant about the deliberate destruction of Taiwan's history due to the tumultuous political nature of life in Taiwan and its experience based on colonial rule. With the first post about the park I'm going to focus on the positive with the beautiful Mid-Lake Pavilion (湖心亭). The pavilion with its over a century year old history has been around so long that it has become one of those defining features of an ever-changing and expanding Taichung city. The construction of the pavilion and the man-made lake that surrounds it was completed on October 24th 1908 (明治41年) and was to coincide with the celebrations that marked the completion of a railway line that connected Kaohsiung with Taipei and Keelung in the north. As one of the Japanese colonial governments major development projects, the ceremony that would celebrate the completion of the railroad was to be a grand one with Prince Kanin Kotohito (閑院宮載仁親王) coming from Japan to participate in the ceremony. The railroad, which stretched almost the entire length of the western side of Taiwan was thought to signal a new era of peace and stability in Taiwan and help to usher in a new period of modernization that would bring economic stability to the people of the island. As the inauguration ceremony was to be held nearby the Taichung Train Station, the pavilion was to be used as a place for the prince to escape the sun, enjoy some fine Taiwanese tea and relax. Interestingly, I have seen some references that implied that in 1923 Crown Prince Hirohito had also visited Taichung as well as the pavilion, but I can't actually confirm whether or not this is true. As a staunch supporter of state Shintoism, it was important for Prince Kotohito to see Shinto shrines set up in each of the places he visited on his trips to Taiwan and during his visit to Taichung, he insisted that a shrine be set up nearby. A few years later the Taichung Shinto Shrine (たいちゅうじんじゃ) was set up within the park and only a short walk away from the pavilion - I'll go into more detail about the shrine in my next post about the park. If you didn't really know much about the history of the pavilion, you probably wouldn't be able to distinguish that it was built with a Japanese prince in mind. The pavilion was designed in a way that blended the concept of a traditional Japanese tea house with that of Western architectural design. The double-sided pavilion (雙閣亭) sits above the man-made lake on cement slabs with each side of the pavilion being facing a 45 degree angle away from the other. The frame of the building was built with cast iron while the interior and parts oft he exterior are made of Taiwanese cypress. The roof of the pavilion is probably the most "Japanese" part of the structure but still differs from the traditional Japanese roof designs that are still common in both Taiwan and Japan. Each of the four-sided pavilions has a roof with a high arch. 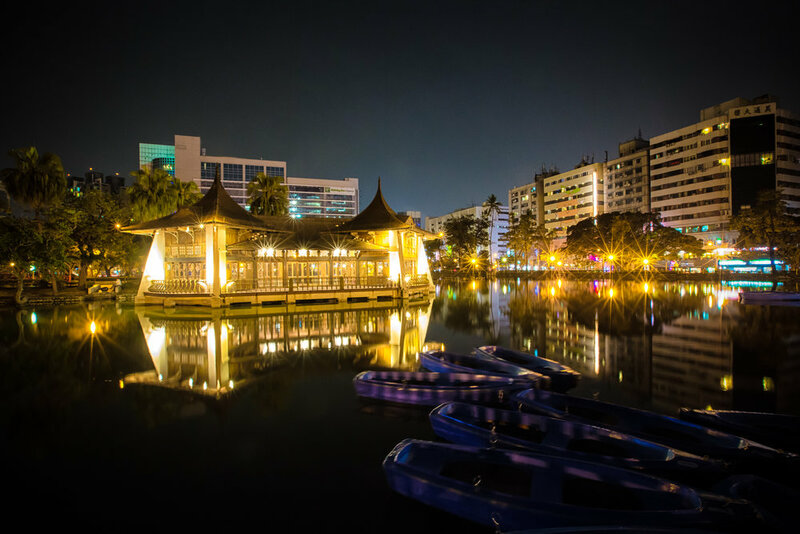 For photographers, the Mid-Lake pavilion is one of those defining images of Taichung and is an excellent subject to shoot both during the day and the night. The pavilion currently isn't open to the public as renovations are taking place to repair the interior but should be open again sometime in the future. If you are in Taichung a stop by the beautiful Taichung Park is highly recommended - The park is easy to access and is just a short walk from the train station. The pavilion is one of those century-old historic buildings leftover from the Japanese era and is excellently preserved so I recommend checking it out if you have time. I'll be posting again in the next week or so with my less positive review of the Taichung Park, so if you're interested in a bit of criticism (hey, its the Internet, people love negativity) check back to see what I have to say.